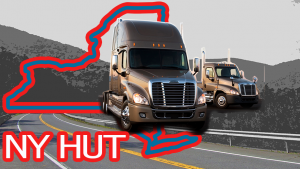 NY Filing Requirements for Highway Use Tax | LAE Business Services, Inc.
New York State imposes a highway use tax (HUT) on motor carriers operating certain motor vehicles on New York State public highways (excluding toll-paid portions of the New York State Thruway). The tax rate is based on the weight of the motor vehicle and the method that you choose to report the tax. If you have been issued a certificate of registration ( except a highway use tax trip certificate of registration), you must file a highway use tax return even if no tax is due, or even if another person will pay any tax due on the use of the vehicle operated under the certificate of registration. Quarterly – You must file a highway use tax return and make payment of tax due each quarter, starting with the calendar quarter when you began operations in New York State. Always consult your tax professional before filing any returns..